Co-produced by Meta.Morf / TEKS – Trondheim Elektroniske Kunstsenter. 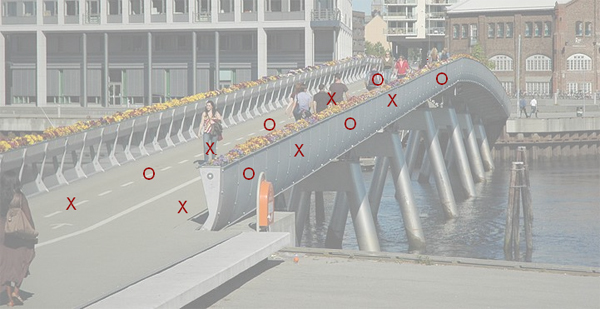 The installation is based on rhythm and sound generated by pedestrians passing the Shipyard Bridge (Flower Bridge, Trondheim). 8 contact speakers and 8 contact microphones are mounted to the underside of the bridge walkway. Through exploring the rhythmic expression, the installation relates to development and negotiation of meaning in language. Rhythm patterns recorded from the audience walking across the bridge are recorded and used as source material for the development of – and negotiation between rhythmic patterns, , where the identity and character of the different time patterns are mixed and woven into each other. An organic system occurs in the use of back links in both the audio signal and the control mechanisms of pattern recognition and synthesis. The project is supported by the Norwegian Arts Council. Installation for a pedestrian bridge is the first manifestation of a sound and light installation for Skarnsundbrua, a 1,000 meter long cabel-bridge, in a collaboration between Øyvind Brandtsegg and artist Viel Bjerkeset Andersen, where Inderøy municipality is the principal. Skarnsundbrua from pekka on Vimeo. Øyvind Brandtsegg is a composer and performer working in the fields of algorithmic improvisation and sound installations. His main instrument as a musician is Hadron Particle Synthesizer, ImproSculpt and Marimba Lumina. As musician and composer he has collaborated with a number of excellent artists, e.g. Oslo Sinfonietta, Motorpsycho, Kristin Asbjørnsen, Live Maria Roggen, Trondheim Jazz Orchestra, Trio Alpaca, Tre Små kinesere, Zeena Parkins, Maja Ratkje. Within the field of sound installations, he has produced both temporary and permanent works, for example “Flyndre” active for 10 years in the period 2006-2016.